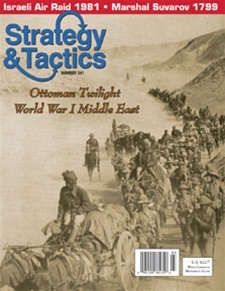 World War I in the Middle East (TOTO for short), is an intermediate-complexity simulation of the Ottoman Empire's campaigns, and those campaigns waged against that realm, during World War I. One player controls the Ottoman forces along with other Central Power units. The other player controls the various Allied contingents. TOTO has been designed by Joseph Miranda. The concept and exploitation of victory points is central to play of the game. Players begin with a designated number of victory points, which they may keep, or expend them to gain reinforcements and execute other actions. Players gain new victory points as a result of achieving their strategic objectives. Players lose victory points when they suffer losses in combat. To win, you must have more victory points than your opponent; so play becomes a competitive balancing act between attaining new objectives without spending too many of your previously earned victory points to do it. Each player has a range of unit types available: infantry, cavalry, expeditionary combined arms forces, early mechanized units, air and naval, as well as guerrillas and the major personalities of the era, such as Lawrence of Arabia. Logistics are also critical, as players utilize supply units to enhance their movement and combat capabilities. The 34x22" large-hex map covers from Mecca and Medina north through Mesopotamia to the Caucasus, west to the Nile Delta, east to Persia, and northwest to Adrianople, at 87 miles per hex. Each game turn equals a quarter of a year. There are 280 half-inch, NATO-style (and some iconic), unit-counters. Units of maneuver are primarily divisions, but numerous corps, brigades, regiments and battalions are also included in the orders of battle. There are two short scenarios, one early war and one late war, along with a full campaign game. The rules run to approximately 15,000 words; so two experienced players can finish the campaign game in about six hours.